Coming from an aficionado of all things beautiful, the Chandelier rates highest as the finishing touch in the well-appointed home. Chandeliers are associated with domestic elegance, wealth and beauty, thanks to scene decorators for glamorous Hollywood movies. Lavish cut-crystal chandeliers hanging from elegant dining room ceilings have come a long way from their humble beginnings. 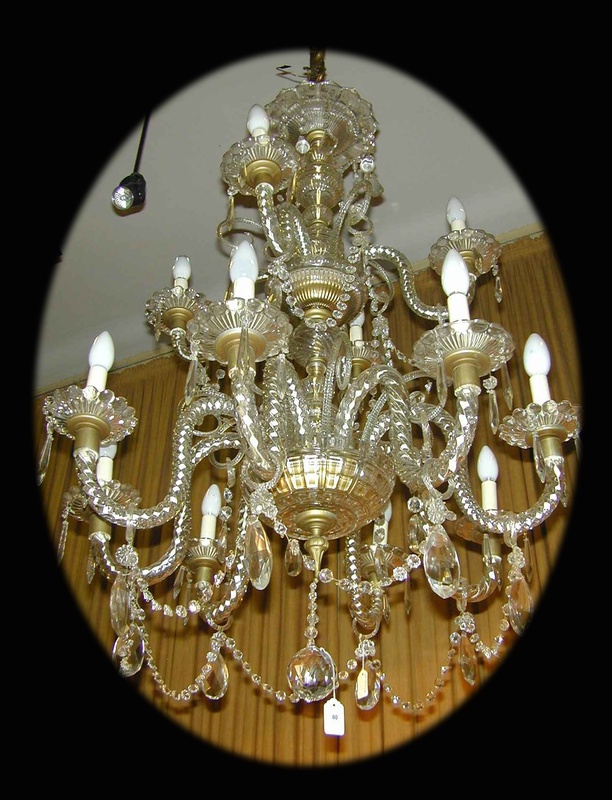 The derivation of the English word Chandelier, dating from 1736, comes from the French Chandelle (candle). The Latin derivation is from the word Candelabrum. The first chandeliers were designed as a humble wood cross with a spike on each end supporting candles made of animal fat. These were suspended from ceilings of 15th century medieval abbeys and churches, as they offered a more effective form of lighting. Later this simple cross design was adapted to variations of a many-candled crowned ring, embellished with long curving arms of ormolu (metal castings). 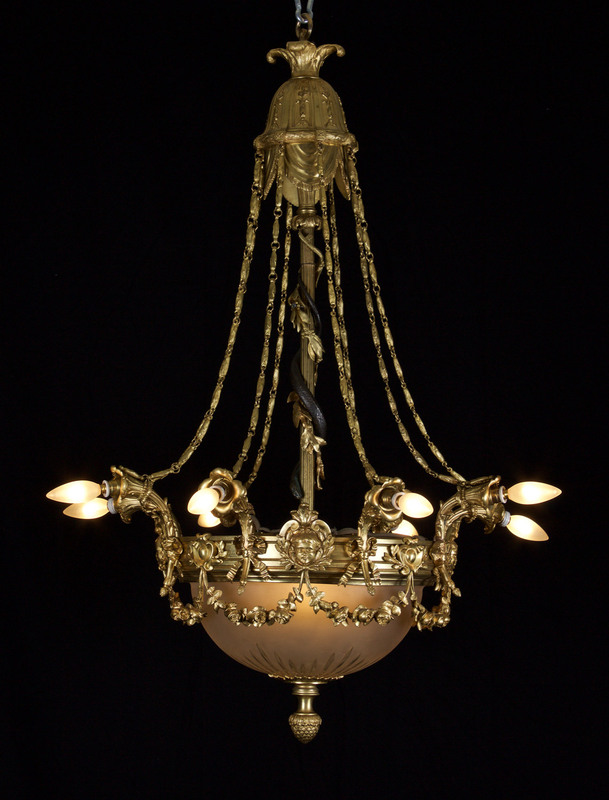 If you look at Schweitzer Linen’s Chandelier 8 shown below, you can see the graceful branch-like shapes of the cast Bronze ormolu arms, reminiscent of the metalworking style developed during this period. Only Palaces, grand homes of the Nobility, wealthy merchants and clergy could afford the candle-lit chandelier, then a symbol of wealth and status, due to its high cost. The common farmer and tradesman had no use for this type of (fire hazard) lighting as their days were scheduled between sunrise and set. 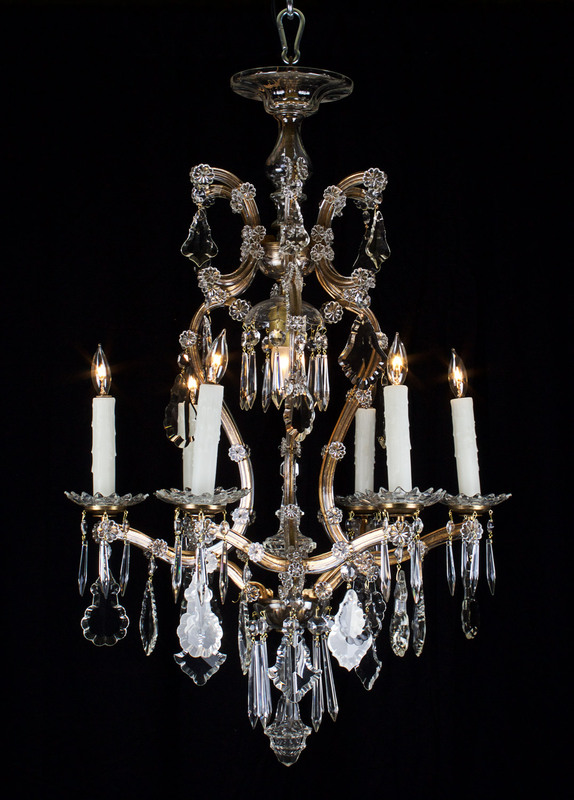 By the end of the 16th Century, rock crystal was incorporated into chandeliers to refract and defuse light. This natural transparent crystal, unlike man-made glass, has for thousands of years been prized, much like diamonds, for its spectacular quality of rich light refraction. Below is Schweitzer Linen’s Chandelier 11. Note the crystal drops expertly cut to reflect and refract light on its many planes. 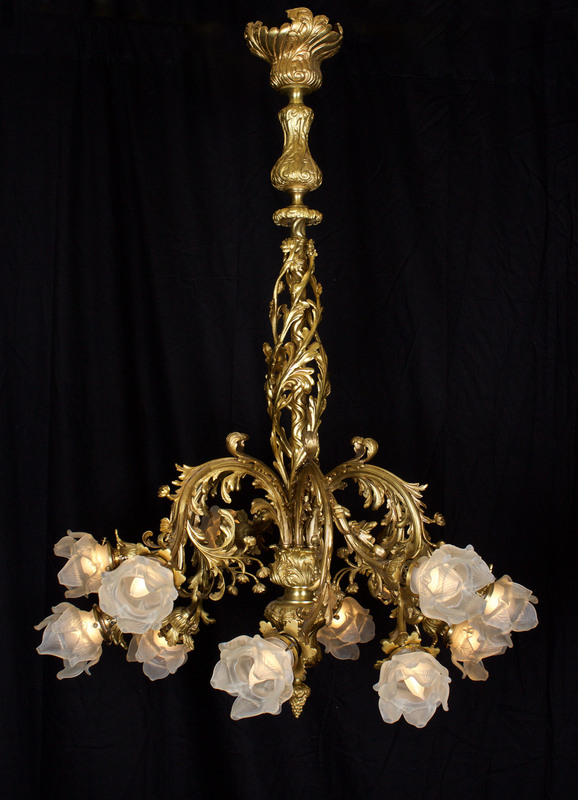 By the 17th Century, elegant chandeliers were used in prosperous homes, as artisans began applying their skills creating beautifully ornate lighting, using brass, refractive mirrors and cut quartz crystals. George Ravenscroft, an English glass-smith from the late 17th Century, is credited with introducing leaded glass, a softer glass, to create more decorative light scattering glass in chandeliers. In the late 1800’s Daniel Swarovski of Austria (yes, the name we fashionistas know well!) developed a better system of cutting this leaded glass which resulted in the chandelier evolving into a work light-refracting sculptural art. The Bohemian style of chandeliers became hugely popular all across Europe, because of the light refraction from expertly cut crystal facets and bevels. The largest Bohemian model, a 4.5-ton, 750-lamp chandelier from Queen Victoria, is still hanging in the Domabahce Palace in Istanbul! 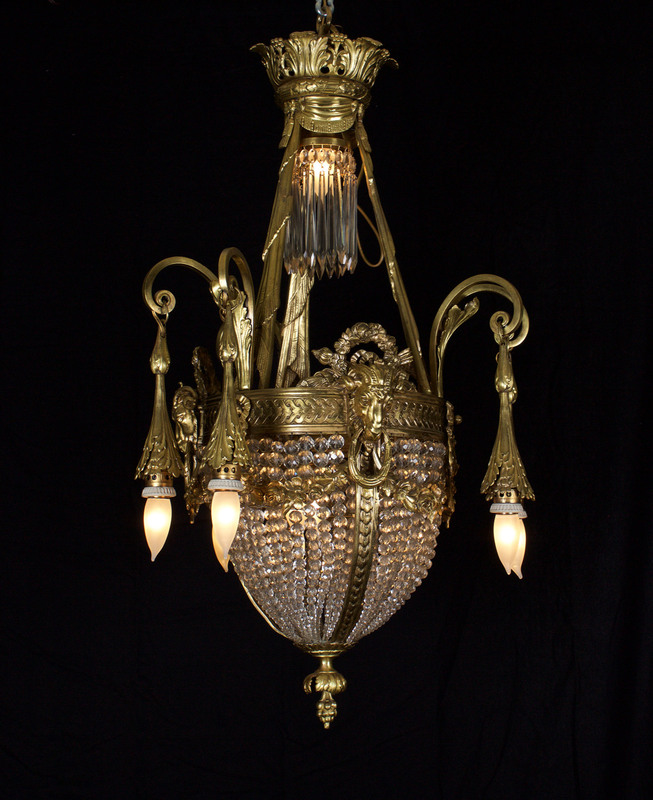 By the late 18th century, chandelier styles incorporated ancient Greek and Roman Neoclassical motifs, and mythological creatures, using carved gold-plated wood and cast metals. 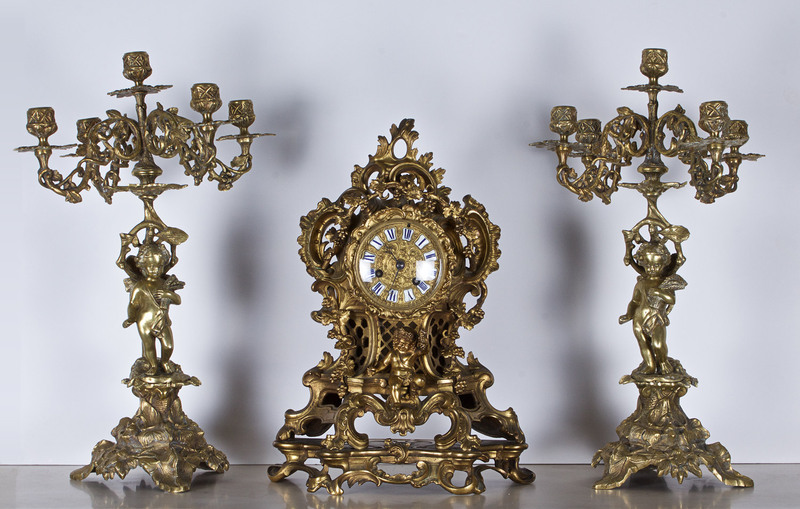 Note Schweitzer Linen’s beautiful Clock D-Ore with Bronze Mantle Candelabra shown below, for its ancient Greco-Roman inspiration. Later, Murano glass-makers in Italy developed Soda Glass, which is a lightweight and therefore sculptural. Rather than using flat clear panes of glass to reflect candle light in chandeliers, this new clear or colored glass recipe allowed the shaping of glass into flowers, fruit, and elegant swirls of branches and leaves. Shown below are Schweitzer Linen’s Chandelier 4, 5, and 9, with crystal flower petals and buds, typical of Murano style glass-making. 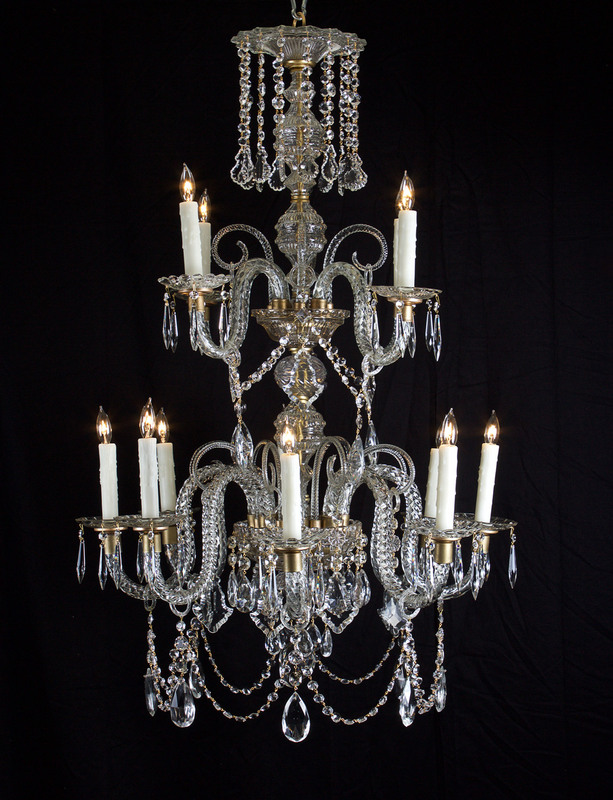 Below are Schweitzer Linen’s Crystal Candelabra, and Chandelier 10, which are almost entirely made of Crystal, including the ornately shaped arms, also employing the Murano glass-makers technique. 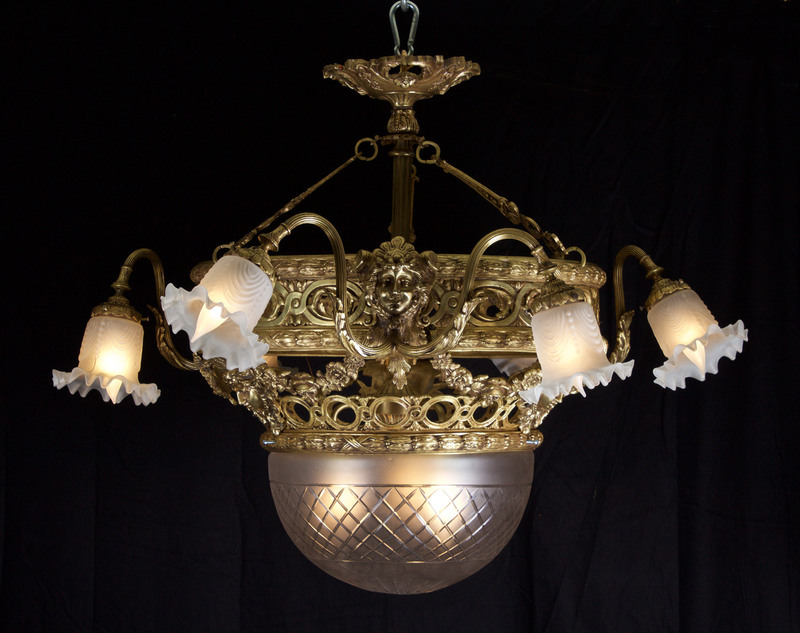 We are blessed to find these gorgeous sculptural lighting creations still available to add the crowning glory to our homes, whether in a grand entrance, dining or living room, bedroom, or even a small powder room. Whether lit or not, these prizes demand attention and add finishing elegant touches to our well-appointed homes. All items featured in this blog are available for purchase. For inquires please comment below or email us at info@schweitzerlinen.com. For our entire Antiques collection visit our Flickr page.